Visit Batteries online at Batteries.com for all your battery needs. Batteries is a leading online battery superstore, a complete store and information site that encourages consumers to purchase products essential to their mobile lifestyle. From laptops to cameras, from camcorders to phones, Batteries has every battery you'll ever need. Since 1999 Batteries has continued to strive toward being the ultimate battery source. Save on your next battery purchase with Batteries.com discounts, Batteries.com coupons and Batteries.com savings from 58Coupons.com. Save 15% store wide at Batteries.com when you use this code at checkout. Click the link to start saving. Act now and take advantage of free shipping on your orders of $50 or more with this coupon code from Batteries.com. Batteries.com is now offering a 10% discount on your order with this coupon code. Click to start shopping. Act now and enjoy free shipping on all laptop batteries from Batteries.com. Click link to enjoy this deal. Visit Batteries.com and save up to 50% on select items featured in the daily deals section. Click link to get started. 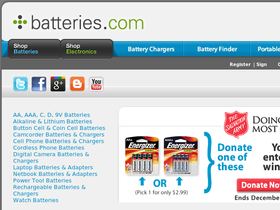 Batteries.com has batteries of all kinds including camera batteries starting from just $4.99. Don't miss out on the clearance section at Batteries.com where you'll save up to 40% off regular prices. Click link to start shopping.